Mclean, Steve. "Nickelback". The Canadian Encyclopedia, 22 March 2015, Historica Canada. https://www.thecanadianencyclopedia.ca/en/article/nickelback-emc. Accessed 24 April 2019. Nickelback. Rock band formed in Hanna, Alta, with Chad Kroeger (vocals, guitar), Ryan Peake (guitar, vocals), Mike Kroeger (bass) and Ryan Vikedal (drums), and moved to Vancouver in 1996. Nickelback. Rock band formed in Hanna, Alta, with Chad Kroeger (vocals, guitar), Ryan Peake (guitar, vocals), Mike Kroeger (bass) and Ryan Vikedal (drums), and moved to Vancouver in 1996. The band released its Curb debut album later that year, but really came into the Canadian spotlight with the unveiling of its second album, The State (widely released in 1999-2000), which sold more than 100 000 copies at home and 500 000 in the US. That record earned Nickelback a 2001 Juno Award for best new group and set the stage for its Silver Side Up successor later that year. The album contained the year's most played song, "How You Remind Me," as well as the hits "Too Bad" and "Never Again." Those songs helped propel Silver Side Up to sales of almost 10 million copies worldwide, including more than 800 000 in Canada, which made the quartet one of the most popular rock groups around the globe. The album reached the top of the sales charts in Canada, the UK, Austria, South Africa, Ireland, Australia, and New Zealand. Nickelback won best rock album, best group and best single for "How You Remind Me" at the Junos in 2002, and at the Junos in 2003 frontman Chad Kroeger was named songwriter of the year for that song and for contributing "Hero" to the soundtrack of the smash movie Spider-Man. The band released The Long Road in September 2003 and the album rocketed instantly to the top of the Canadian sales chart, while lead single "Someday" became a multi-format smash. "Figured You Out" and "Feelin' Way Too Damn Good" picked up where that song left off, and the band embarked on an ambitious Canadian tour that hit secondary and tertiary markets as well as major cities. Nickelback received five Juno nominations in 2004 and captured the best group and fan choice awards. After focusing on Canada, Nickelback took its pyrotechnic-laden live show on the road to the United States, Europe and Asia. Nickelback began working on the follow-up to the quadruple-platinum The Long Road (which has since sold five million copies worldwide) in early 2005 with new drummer Daniel Adair, a Vancouver native who had previously been with successful American rock band 3 Doors Down, and subsequently recorded the 11-song All The Right Reasons, with Kroeger and Joey Moi co-producing it at Kroeger's studio. It was released in October 2005 and was introduced by lead single "Photograph." "Savin' Me," "Far Away," "If Everyone Cared" and "Rockstar" later became hits and helped the album top sales charts in Canada, the US and New Zealand. It reached domestic sales of more than 600 000 in Canada and 10 million worldwide as the group continued to tour relentlessly. 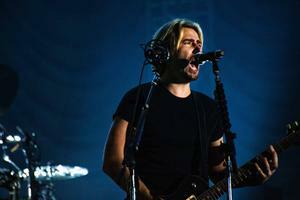 Nickelback released Dark Horse in November 2008 after it was introduced by lead single "Gotta Be Somebody." The album was co-produced by the band and Robert John "Mutt" Lange, who had previously worked with Shania Twain and Bryan Adams, among many others. It debuted at number one on the Canadian sales chart and in the top five in the US, Australia, New Zealand, the UK, Germany, Austria and Switzerland. It sold two million copies in the US and 500 000 in Canada on the strength of the six singles that followed "Gotta Be Somebody": "Something In Your Mouth," "If Today Was Your Last Day," "I'd Come For You," "Burn It To The Ground," "Never Gonna Be Alone" and "Shakin' Hands." Dark Horse won the 2009 fan choice Juno Award while also taking honours for album of the year; Nickelback took the group of the year award. Nickelback was named the top group of the decade by US-based Billboard magazine for its impact and importance to the music industry, as well as for selling more than 30 million albums worldwide. While EMI Music Canada had released Nickelback albums domestically and the group was signed to Roadrunner Records for the rest of the world, the band has signed a deal with Live Nation that covers three touring and album cycles, with an option for a fourth, and includes recordings, touring, merchandise and other rights. In 2010, Nickelback performed in the closing ceremonies of the Vancouver Winter Olympics. They were nominated for the fan choice award and for rock album of the year at the 2010 Junos. Nickelback's seventh studio album, Here and Now, was released in November 2011 and topped sales charts in Canada, Australia, Japan and the United Kingdom while becoming a hit in many other countries. Its sales were certified double-platinum in Canada and Australia, and the album spawned five singles. The group received four 2012 Juno nominations and toured around the globe through much of the year in support of Here and Now. NickelbackListen to Nickelback on iTunes.